Author: Haddam, Jane Set In . . . In the tradition of P. D. James, Jane Haddam's novels combine compelling story lines with a keen-eyed, complex sense of the character's psychology and sharp, evocative sense of place. Over the years her novels featuring retired F. B. I. agent Gregor Demarkian have won her the respect of the critics and an ever-increasing number of devoted readers. 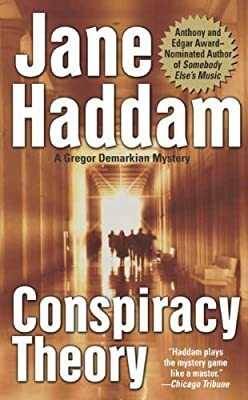 Now with Conspiracy Theory, all of Haddam's ample of gifts are on display in a chilling novel of class, conspiracy, and murder. Cavanaugh Street is a mostly quiet Armenian neighborhood in downtown Philadelphia where nearly everyone knows everyone else and certainly knows their business. But that quiet is destroyed when the Armenian Orthodox church is destroyed by bombing and its cleric, Father Tibor Kasparian, is hospitalized as a result. What would normally be a front page event, however, is overshadowed by another event across town - when Philadelphia Main Line society is shocked by the murder of one of their own. Anthony van Wyck Ross - the head of one of the major investment banks and a cornerstone of Main Line society - is murdered at the Around the World Harvest Ball being hosted at his mansion. Gregor Demarkian, former head of FBI's Behavioral Sciences Unit, and longtime resident of Cavanaugh Street, is soon enmeshed in both cases. With the Ross murder, there is the never-seen conspiracy theorist Michael Harridan who in his literature has claimed that Ross was a member of the dangerous secret ruling elite, The Illuminati. With the church bombing, there were the anonymous threatening letters received by Father Tibor just prior to the bombing. Together - if indeed they are in some inexplicable way related - they are the most challenging cases Demarkian has ever faced.